Figure out what’s wrong as a patient cries in agony // Stand up to your superiors // Try not to stab a soldier’s liver // When he dies, thank God he’s not real. The agony is real, even if the patient is not. In a training exercise at the Center for Medical Simulation in Cambridge, Mass., emergency medical workers will try to save the “life” of this high-tech mannequin. Knowing it was a game didn’t make Ning Tang, a third-year Harvard Medical School student, any less tense. Her patient seemed to be suffering a heart attack; he was having trouble breathing and complained of severe chest pain radiating to his arm. But his plummeting blood pressure complicated the diagnosis. After an EKG, Tang surmised that the problem might be with the right side, rather than the left, of the man’s heart, and that damage to either side could be responsible for the drop in blood pressure. If Tang administered dopamine, making the heart pump harder and raising the blood pressure, the added stress could jeopardize an already compromised heart. But a second option—administering fluids—would work only if the right-side diagnosis was correct; for a left-side problem, too much fluid might be a death sentence. “I found myself thinking, I’m taking too long to make these decisions,” Tang recalls. With time running out, she called for fluids, then sighed in relief as the patient’s blood pressure began to rise. 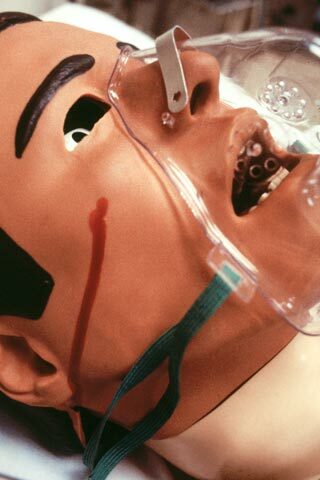 That’s the thing about medical simulators: They make doctors sweat, and they make them learn. Willingly suspending disbelief, students, residents and even experienced physicians thrust themselves into unfamiliar or uncomfortable clinical situations. They snake catheters through lifelike webs of veins and arteries, treat gaping chest wounds and struggle to revive anesthetized patients who have gone into cardiac arrest. Working as part of a team in the emergency room or surgical suite, they deal with medicine’s often rigid hierarchies. And they make mistakes—some negligible, some fatal. The lessons learned may ultimately save some of the estimated 195,000 patients a year in the U.S. who die because of medical errors. Advocates of simulators believe their widespread adoption could greatly improve those numbers. 1. “A Brief History of the Development of Mannequin Simulators for Clinical Education and Training,” by J.B. Cooper and V.R. Taqueti, Quality & Safety in Health Care, Oct. 2004. An excellent grounding in the history of simulators. 2.www.thesimgroup.org The next best thing to playing with them: detailed descriptions and demonstrations of VIRGIL and other simulation devices being produced at The Sim Group. 3. “The Future Vision of Simulation in Health Care,” by David Gaba, Quality & Safety in Health Care, Oct. 2004 (Supplement 1). One of the pioneers of modern simulation offers his outlook on the field’s future. Moulage artist Bobbie Merica creates a fake bullet wound. Before turning medical students loose on real patients, most schools have them practice on imposters.